Full automatic used at a concert. 58 dead and 500+ injured. Suspect on 32nd floor. Last edited by Stealth; 10-02-2017 at 13:03..
MSM not reporting it yet shockingly. CNN picking it up now. Fox slacking. Lots of videos being uploaded. FOX is reporting multiple shooters at several locations. Plug in missing or something? Medics reporting that they are getting shot at in Tropicana. 1 suspect down in room they breached. 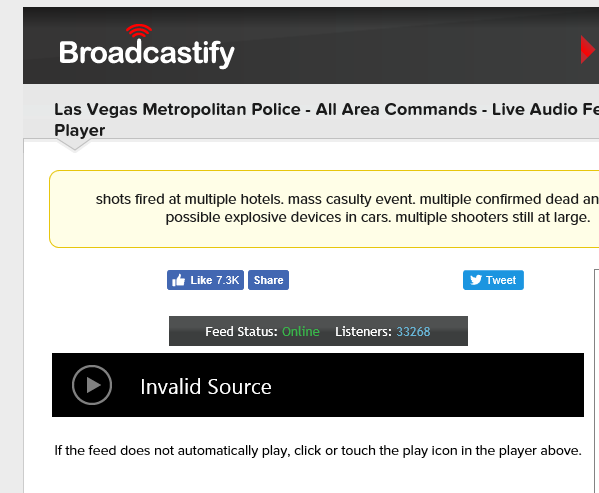 KLAS-TV is also confirming multiple shooters at several locations upwards of 50+ dead.